The main problem I have with the X6 is the reliability. I LOVE LOVE LOVE the V8, but it seems to be a ticking time bomb! What are your experiences with the twin turbo 6 cylinder X6? When I test drove the 6 cylinder, the power was good, but nothing special. I still like the feel of the car though, but it now comes down to reliability. How reliable is the X6 35i, what can I look to see regarding repairs and repair bills, and do you recommend this car overall? I test drove the X6 3.0 and the 5.0 back to back - what a world of difference the V8 makes. I'm in love with the X6 but haven't pulled the trigger on one either. Of course there is simply NO Comparison to the Edge. If you can afford the X6 get it, you know you'll be smiling from ear to ear. I'd rather you buy the X4 than the Edge, at least you'll still have a BMW that looks like the X6 with the same engine as the X6 3.0. I tested both the 35i and the 50i and agree, there's no comparison. It is such a shame the 4.4L V8 is so unreliable. I'm still leaning towards the Ford Edge Sport though as it is very roomy inside, has a much more refined infotainment system, and the 5.6 second 0-60 gets the job done. The Edge Sport is also about half as much as the X6 35i. My Parents have the Edge Sport, their premium seats are awesome, it is roomy and its "enough". Practicallity usually wins out with me so I'd more than likely lean the same where money is involved. Anytime I'm there they make me drive and it gets us there and back. It just doesn't leave an impression. When I got out of the X6 I was like WOW, smiling like crazy. I love "driving" vs just getting A to B. The hard part when money dictates is to find the best WOW for your buck. I was in the market for an X6 and couldn't decide but ended up buying my Dad's F150 so they could get the Ford Edge, they're getting older and just didn't feel comfortable driving the truck anymore - too big for them to manuver. Believe me I know the struggle of wanting vs practicality so good luck in your journey. 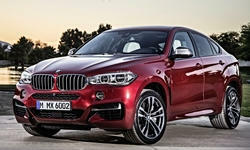 I also just heard BMW have started or is about to launch a new leasing progam on used vehicles coming in off of lease. The market is flooded with vehicles coming in off lease right now. I think this will be a great way for people to get into a luxury performance car for less money and since you're leasing you wont feel locked into a vehicle if it starts giving you fits. Just FYI! What is crazy about a lot of the used bmw SUVs is that they have been pulled off the market due to the airbag recall. I was at the dealer recently and he said he had no clue when the cars would be fixed and back on the market. His dealership alone had over 100 bmws that could not be sold due to the recall. Right now there are tens of thousands of bmws sitting and rotting. Would be cool to scoop one up once they are fixed and flood back into dealerships. Btw only bmw dealers are doing this. Any used x6s you see right now at non-bmw dealerships are defective and have potentially deadly takata airbags in them. One last note, I have a 3 mile commute- which is really affecting my decision right now. If I had an hour commute I'd easily be swinging towards the BMW X6 over the edge sport.